There’s a certain quality about some 60’s and early 70’s guitar tones that seem to be rather exclusive of that psychadelic era. If you hear Mick Ronson on Bowie’s Ziggy Stardust era (live in “Santa Monica ‘72” is great), Pink Floyd at The Piper at the Gates of Dawn or British blues masterpieces by The Yardbirds, Cream, Faces, Stones and so on, those searing and cutting guitar tones sound like they could rip one’s ear apart from his head! The funny thing: they don’t, and they sound great! Remember when some mop-topped kids met Dylan, grass, acid and grew up to change music forever? From their rubber souls straight to the lonely hearts club, this is it. After all these years, it’s getting hard to hear that kind of tone again. Where is it? Well, now it’s here with all the power you ever wanted. The Kryptone derived from the classic first incarnation of the Vox Tonebender, a fuzz pedal heard in many classic British ensembles. Unlike many people that intend to replicate vintage pedals exactly as they were made by the original makers and documented in their schematics, our goal was to use that as the basis, hear the classic tones we really liked and then shake it until it sounded like we always wanted it to be. Also unlike many people that go into this kind of adventure, we had plenty of real vintage references to fuel the process, including two original superb sounding Vox Tonebenders, and many other relatives. Our main objective here was to get that dirtier, grungier saturation, chewing your guitar notes with lots of sharp edges, and that high frequency cutting like a hot knife on butter! In that process, we also solved some old issues and made the box friendly enough to fit any 21st century pedalboard without any hassle or compromise. Even Superman would be proud! The LOWS control is a key feature on this one because it sets the frequency of a hi-pass filter at the input; so, it allows you have a full and grungy sound or take the bass out of the way to enhance the trebly, searing tone we talked earlier. It also works great for neck pickups reducing flabby lows and enhancing clarity. Full counter-clockwise is fat, with lots of compressed lows; rolling it clockwise defines the bass content and helps guitar volume clean up; full clockwise is very tight lows and bright sharp attack (try this like a treble booster, with lower Fuzz and higher Volume into an overdriven amp, works wonders!). The HIGHS control, on the other side, has the more delicate job of setting the high frequency content on your fuzzy sound: it lets you travel from smooth and round to bright, square wave aggressiveness. All the way up is the free route for your sixties high frequencies straight to your speakers; turn it back a little for moderate treble cut, balancing a bit of germanium-like warmth; full counter-clockwise makes highs very round and warm, good if your ears are getting tired of rock n’ roll or if you don’t wanna scare pretty Lois away. But if you have your telecaster open-tuned, with the sixth string missing and the skull ring, let those highs shine, please! Then we have an external transistor BIAS control, much like our old MOOD knob. A lot of people seem to be putting these controls on fuzz boxes nowadays (back in 2007, when Deep Trip started, it wasn’t so popular), but they all mess with the volume, so it’s hard to change bias settings between songs, for example. Our new BIAS control is completely independent from output amplitude, so you can walk all around without having to reset your volume. Nice, huh? Typical voltage is close to the middle, where you have more symmetrical clipping, take it as a “standard” position and explore from there. Use slightly higher settings to raise headroom and asymmetry, for even better guitar volume clean up and more defined pick attack, upper extreme is more spanky and metallic. Slightly lower settings (from the middle) bring compression and more mushiness and softness to the attack, lower extreme brings a “gate” effect in, like a battery almost dead (lower your guitar volume for even heavier gating). Have some fun all around those! For VOLUME, the old ones usually need to be close to maximum match bypassed level. Not here: we like our pedals to have enough volume to let you get some tube amp overdrive if you want, so you can match bypassed volume with FUZZ maxed way before 12 o’clock; from there all the way to max, you have more gas to saturate what comes next in your chain and add further shades of clipping to your fuzz. Try it with your tube amp, should sound nice! Many players like to set their fuzz boxes with the volume high up there, so mixing some tube amp clipping may be a good way to go to get some magic. The heart of this green box is a modified Vox Tonebender mkI circuit, but we don’t make clones or replicas. 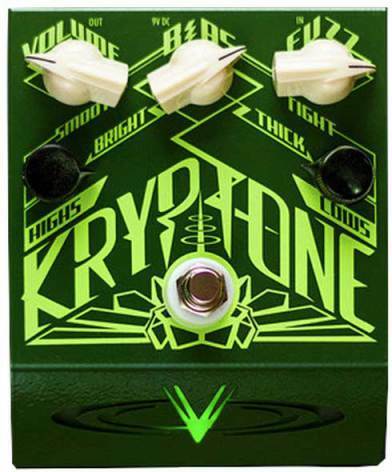 So, like all Deep Trip pedals, the Kryptone takes the usual 9V, center negative power supply, as most standard pedals do. No hassles here, no exclusive power supply, no polarity inversion needed, plain simple. It is also completely immune to any input impedance issues, it works great with a wah-wah and can be put anywhere in your pedal chain, even after buffers, unlike the old ones and the replicas that have to come first always. If that’s not enough for you, we’ve also worked on output impedance to make it more friendly to lower input impedance amp; that’s the issue that makes most vintage fuzz pedals sound buzzy and weird (in a bad way) on some transistor amps, that’s solved as well. Hey, and like all Deep Trip pedals, it looks cool as hell, doesn’t it? So let’s put this extraterrestrial green rock to shine!